When we lose someone we love, out of sight never means out of mind. For as long as we hold them in our hearts, they are never truly gone. 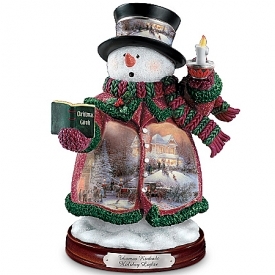 Now, keep the memory of a loved one burning bright with the Thomas Kinkade A Love Beyond Measure Figurine, available only from The Hamilton Collection. Inspired by the radiant artwork of Thomas Kinkade, this Irish-inspired angel figurine is truly a joyful remembrance of a treasured soul.With eyes as green as the Emerald Isle and hair as red as a sunset over Galway Bay, this handcrafted Irish angel figurine is a noble tribute to your beloved. 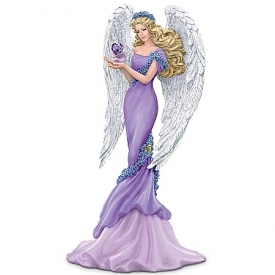 From the "etched" feathers of her glittery wings to the golden trim accenting her collar on down to her Celtic-inspired corset, this beautiful figurine is painted by hand! 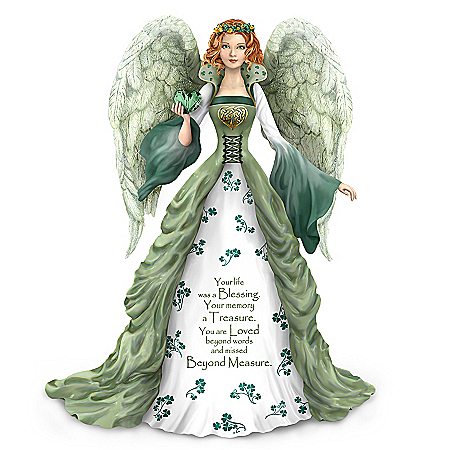 Her dazzling faux emerald heart is a sparkling reminder of the words so tenderly expressed upon her gown - that memories of the heart are truly a treasure. 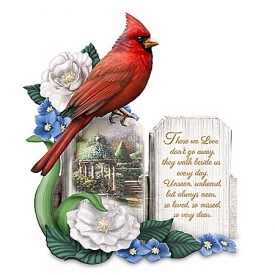 Strong demand is anticipated for this inspirational gift, so don't delay. Order now!